The Cruzer Glide USB flash drive has a sleek, streamlined design with an attractive black and red color scheme. Its compact size means it can easily slip into a front pocket or purse. Store and protect everything from cherished photos and videos to sensitive work files with the Cruzer Glide USB Flash Drive. This 16 GB drive comes with SanDisk SecureAccess software, which lets you password-protect and encrypt files you want to keep private while permitting access to files you want to share. Additionally, Cruzer Glide's 2 GB of secure online storage make it easy to safeguard your most valued files. The compact drive features a red slider that glides shut to shield the USB jack. Compact and lightweight, the Cruzer Glide USB Flash Drive offers an easy way to transport photos, videos, music, or work documents. With 16 GB of storage capacity, the Cruzer Glide can store all your favorite media files. 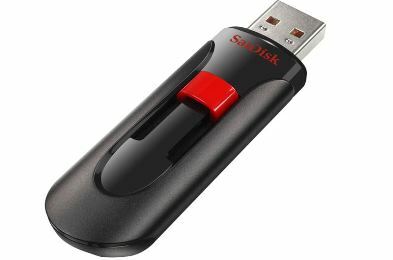 The Cruzer Glide USB Flash Drive comes with SanDisk SecureAccess software, which allows you to password-protect and encrypt your private files while providing open access to those files you want to share. This password-protection technology uses 128-bit AES encryption and is supported by Windows XP, Windows Vista, Windows 7, and Mac OS X v10.5 or later (software download required for Mac). Instead of using a cap to cover the USB jack, the drive has a slider that glides open and closed. Simply open the slider and insert the jack into your computer's USB port to transfer files to and from your computer. When you use the Cruzer Glide USB flash drive, you have the option of protecting your data with secure online backup offered by YuuWaa, an online data storage and backup service. Up to 2 GB of storage capacity is available. Registration is required.